Joe Eberhardt is a recruiting analyst for Inside the Hall and a high school basketball writer in Indiana. He created IndyHSHoops.com. You can follow him on twitter at @IndyHSHoops. With the July evaluation period in the books, it’s time for our first crack at ranking the ten best prospects in Indiana’s class of 2014. If you have any questions about the rankings, feel free to address them in the comments. 10. Bryant McIntosh, Greensburg: The 6-foot-2 McIntosh is a reliable decision maker whose biggest strength is his shooting. McIntosh is a smart and unselfish player that distributes the ball efficiently but at the same time looks to score himself. He can get past defenders on the bounce and get to the rim, but also scores using a crafty floater and pull-up jump shot from mid-range. McIntosh is sound defensively, but could look to improve his strength and quickness to help him as a man-to-man defender. 9. Jeremie Tyler, Indianapolis Tech: One of the best long-range shooters in the class, Tyler has a quick release on his jump shot and can fill it up from deep when he gets on a roll. The 6-foot-1 combo guard also looks to break down the defense off the bounce by getting past his man and finding teammates for open looks on the perimeter. He buys in on the defensive side of the ball and also possesses good quickness which makes him a threat to defend either guard spot reliably. One area Tyler could look to improve on is looking to score more often off the dribble. 8. P.J. Thompson, Brebeuf Jesuit: Thompson is a heady point guard who makes good decisions and knows how to run a team. At 5-foot-8 he is undersized, but has a nice burst of quickness and is a solid ball handler. One of his biggest strengths is the ability to penetrate and dish the ball off to teammates for open looks. Thompson is also a capable 3-point shooter and can make the defense pay if they fail to check him on the perimeter. Besides improving his strength, Thompson’s biggest area for improvement is expanding his ability to score off the bounce. 7. Tyler Wideman, Lake Central: A wide-bodied (no pun intended) post player with great hands and strength, Wideman embraces his role as a bruiser down low. At 6-foot-7 he plays with physicality as a defender and rebounder by forcing opponents to work and scrap for everything they get. Wideman also has good footwork in the paint and is able to score over either shoulder when he establishes good position in the post. He’s also a willing and able passer out of the low post and often finds teammates before defenses collapse with a double team. His two biggest areas for improvement are becoming more explosive around the basket and improving his conditioning. 6. Sean Sellers, Greensburg: Sellers is a skilled player who has continued to improve throughout his career. The 6-foot-5 sophomore has a reliable shooting stroke from both mid-range and 3-point land. Sellers is also improving his game off the dribble, can to get to the rim and score and does a nice job of creating free throw opportunities. A willing rebounder, Sellers will mix it up on the offensive glass for second chance points. His defensive instincts are strong and with improved quickness he could become a reliable defender on the perimeter. An average athlete with solid length, Sellers’ biggest area for improvement is adding strength and bulk to his frame. 5. Trevon Bluiett, Park Tudor: Bluiett is a player who finds ways to score and has a crafty offensive game. The 6-foot-5 sophomore is a capable shooter from deep, but also looks to get into the paint and earn points using floaters and contested baskets off the bounce. Bluiett also crashes the offensive glass with intensity and is able to score second chance points quite frequently despite his lack of size. His biggest areas for improvement are improving his quickness and lateral movement as a defender as well as improving his overall strength. 4. Perry Poindexter, North Central: An intriguing prospect due to his size and length, Poindexter measures in at 6-foot-7 with a 7-foot-2 wingspan. The sophomore big man is a reliable rebounder that uses his athleticism and length to corral rebounds well above the rim on the defensive end. Along with the aforementioned length and athleticism, Poindexter also has a quick second jump defensively that makes him effective at blocking and challenging shots in the paint. On the offensive end of the floor, Poindexter is still improving, but has a jump shot out to about 15 feet and is reliable at cleaning up on the offensive glass. His biggest area for improvement is adding strength and bulk to his 185-pound frame. 3. James Blackmon Jr., Ft. Wayne Luers: Blackmon is a smooth player who is at his best when he mixes it up offensively. Wired to score, Blackmon has a great stroke from 3-point land, an impressive pull-up mid-range jumper and the ability to get to the rim and finish against physicality in the paint. He has improved his athleticism over the past nine months and looked more explosive as a leaper and quicker on the defensive side of the ball in July. Blackmon’s biggest areas for improvement are looking to expand his game as a distributor and improving as a perimeter defender. 2. Jaquan Lyle, Evansville Bosse: The 6-foot-4 Lyle is a versatile player capable of playing multiple positions on the perimeter. Lyle’s best attribute is his playmaking ability. He possesses great court vision and will successfully make passes that don’t appear possible. Lyle is also a reliable ball-handler who attacks the basket aggressively and looks to draw contact in the paint. A streaky shooter, Lyle could look to improve his consistency from the perimeter to become a more complete scoring threat. He also has above average length and athleticism that aids him as a finisher on the offensive end and gives him great potential as a defender on the perimeter. 1. 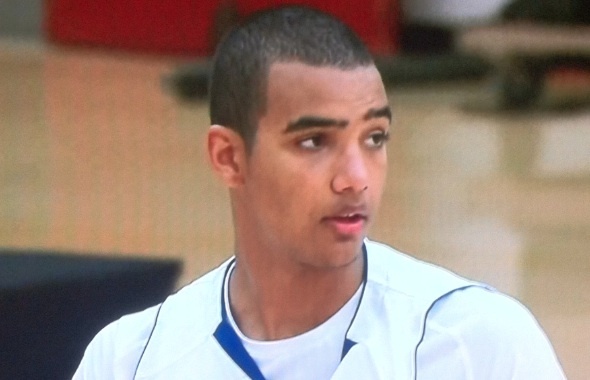 Trey Lyles, Indianapolis Tech: A skilled and versatile power forward, Lyles headlines the sophomore class in the Hoosier state. He has an advanced skill set in the low post including the ability to score using either hand with his back to the basket. Lyles is a capable jump shooter with range out to the 3-point line, but could look to improve upon his shot selection from the perimeter. He’s also a great rebounder on both ends of the floor due to strong hands, well-timed jumps and successful boxouts. Lyles’ biggest area for improvement is adding strength and preparing his body for the rigors of Big Ten play. I think we for sure need / want Lyle as there is just so much you can do with him. Otherwise, given the talent in the class already, I think we are good to let things play out a bit hopefully. It would be interesting to see how Perry Poindexter progresses. I think he looks very good and I think will blossom into quite a player. It too will be interesting to see how Bluitt progresses. A really sharp kid but unclear what position he is right now, etc. I think we should wait a bit. Given how much improved we will be in 2 years and the strenght of the class already, I think we should wait to fill the spot we want as we should likely be able to affort to be pickier. I really like Jaraan Lands after seeing him this summer. Loved his game when I saw him at the USSFA tournament this summer. The way he constantly attacks the basket led to very few empty possessions. I’d have him hovering around the top-5 on my list, possibly higher than Bluiett. Tried to think of other points to debate but can’t think of any. Good list, like where you’ve placed Tyler and Poindexter. Lyle is a guy one builds a team around in my opinion. He is making his decision after AAU ball next season, but I think we should be getting him to commit sooner. I think he might be the most significant player in the `14 class and he might jump ahead of Lyles in the rankings after next year. At 6’4/6’5 Lands can produce and score really well at the high school level, but I’m just skeptical that parts of his scoring won’t translate to the Big Ten. He’s a decent shooter, but also gets a lot of his points on the glass and out muscling people. I’d just like to see him transition to the wing full time if he’s gonna be a BT guy. I agree that he needs to work on his perimeter shooting, and it’s a big concern. I’m less worried about his scoring off the dribble as he seems to do a good job of going into the defender (and not around) and still getting his shot off against bigger guys. Speaking on concerns, I like Jeremie Tyler but he seems to have such a small frame. What do you think about his future? I’m a big fan of Tyler. Saw him in November as a JV player and he looks way more confident 8/9 months later. He has to get stronger and work on his ability to produce off the bounce. He can fill it up with anyone in the class from deep. Pretty good passer too, but not a full time PG in my eyes. I went to school with Lyle last year, I was actually a senior tutor for his English class. Trust me! He has no problems with grades. That rumor has been said more times then I can count. He still might be a little immature but grades are not a issue. Thanks for the news, but any statement that begins with “my cousin” is going to be subject to credibility issues. I join “base” – LOL. Basketball wise Lyle seems very legit and there are 3 more years for him to grow and mature. There is no need to write a kid off at this point. If I had an English tutor who used then instead of than, and “a issue”, I would seriously be flunking English. Immature?? He is a soph. in high school. Let him be a “immature” kid,and enjoy his youth. Let’s keep the conversation on the court and not speculate. 2. James Blackmon….I think this summer showed his game is continuing to improve with his explosiveness. 3. Trevon Bluiett…This summer he showed playing with or without Yogi, the kid is not a role player but a player you can build around or with. He has had the opportunity to play in high pressure situations and has shown he can handle it…for me he gets my #3 ranking.